This blog post will tie in nicely with what I blogged on earlier today about composite endpoints. Read that post first before reading this. I find this statement (from the 1st sentence in the discussion section) to be a vast overstatement of what they in fact found in this study. Examine the table below (I trimmed out the per-protocol analysis results) and see just what was actually reduced by steroids. Steroids had no effect on “early treatment failure”. They significantly reduced “late treatment failure” but this was all driven by one outcome. The only thing steroids did was reduce radiographic progression. 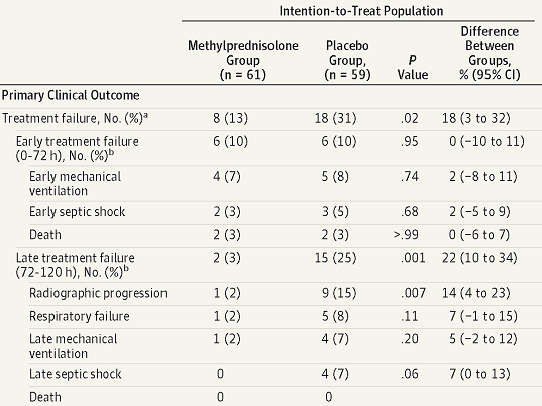 They didn’t help any other outcomes of this large composite but yet the authors make this sweeping statement of steroids being associated with less treatment failure. This demonstrates the importance of looking at the individual components of the composite and not just focusing on the overall composite result. It also demonstrates why I don’t like to read the discussion section of a paper nor the conclusions from an abstract- you will be misled. The reviewers and editors should have toned down these conclusions as they are a gross overstatement of what was actually found.